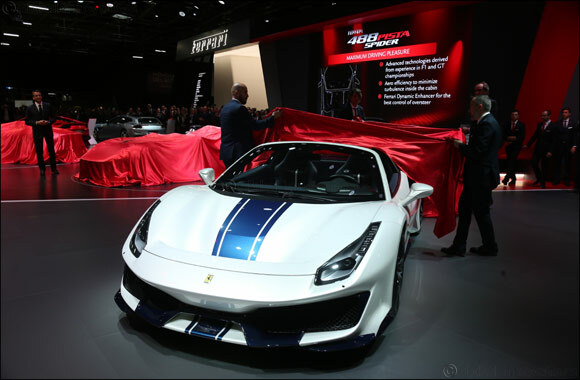 Dubai, UAE, October 03, 2018: After its world premiere at the Pebble Beach Concours d'Elegance®, the new special series Ferrari 488 Pista Spider has made its European debut at the Paris Motor Show. The 50th drop-top model to be introduced by the Prancing Horse is also the most powerful series production spider in Ferrari history, with an unprecedented weight/power ratio of 1.92 kg/cv. The model’s engine, dynamics and aerodynamics are derived from two track cars: the 488 Challenge and the 488 GTE. The latter won the GT class of the FIA World Endurance Championship in 2017, thus giving Ferrari a total of five GT Manufacturers’ titles since the championship’s inception in 2012. Furthermore, this model has very clearly benefited from the extensive development work done to produce the coup� version, the 488 Pista. The Ferrari 488 Pista Spider sports the most powerful V8 engine in Maranello history which was also named Best Engine for the third consecutive year at the 2018 International Engine of the Year Awards. The 3902cc twin-turbo V8 unleashes 720 cv (50 cv more than the 488 Spider) with torque calibrated to deliver a feeling of constant, ever-increasing acceleration. The engine also won the special 'Best of the Best” title as the top engine of all the winners of the last 20 years. The engine’s sound is unique and unmistakable, as befits a special series car. In fact, the sound level is higher than the 488 Spider in all gears and at all engine speeds. The retractable hard top also makes all of this easier for occupants to appreciate than in the coup� version. The new Inconel exhaust manifolds and optimised exhaust bypass logic contribute to the superior quality and the intensity. Ferrari’s unparalleled quality standards and growing focus on client service underpin the extended seven-year maintenance programme offered with the Ferrari 488 Pista Spider. Available across the entire range, it covers all regular maintenance for the first seven years of the car’s life. The scheduled maintenance programme for Ferraris is an exclusive service that allows clients the certainty that their car is being kept at peak performance and safety over the years.